This post is sort of a conglomeration of various cycling things, recipes, and stories. You see, at the same time as the running of the Vuelta a España is the first running of the US Pro Cycling Challenge over in Colorado. Tommy Danielson is a US Pro Cycling Challenge race favorite (no, really this time! ), but he was quite under the weather due to some food poisoning the night before the individual time trial. During the coverage on Versus today, Tommy D described how he threw up all night long and had to crawl down the hallway in his underwear to the team doctor around 3 a.m.. He did not feel better until 5 a.m., but still managed to make it on the bike and only lost a few seconds to the leaders. Not a bad performance. Tom Danielson feeling a lot better at the 2009 Tour of California. I feel Tommy D’s pain, as I’ve struggled with food poisoning before. You see, we spent a beautiful few days in Seville, Spain, rented a car, and drove down to Gibraltar. About 10 miles into the journey, I started feeling queasy. A few miles later I knew I was sick. Then, after a few bouts of having to stop by the side of the road, I realized it was more than sick – I had some sort of food poisoning. We would go down the highway for a little bit, then have to stop, then go for a little bit, then have to stop. Sadly, I lost an entire day of eating fine Spanish cuisine and could only choke down a can of Coke and a couple digestive biscuits. When one is sick, you’re told to make sure you get plenty of fluids so here we go with another soup. This recipe for garlic soup is from Deborah Madison’s Vegetarian Cooking for Everyone. Our buddy Deborah cites this recipe as “good for colds and hangovers”. Excellent. Not sure about soothing the aftermath of food poisoning, but it does make a flavorful broth that enhances any recipe including the Spanish Potatoes with Saffron, Almonds, and Bread Crumbs featured previously on the Vegetarian Vuelta a Espana. 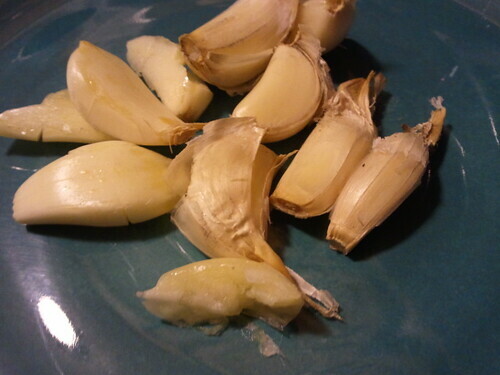 Separate the garlic cloves by pressing down on the heads. Remove most of the papery skins, then smash the cloves with the flat side of the knife to open them up. Heat the oil in a soup pot, add the tomato paste, and fry over medium heat for about a minute. 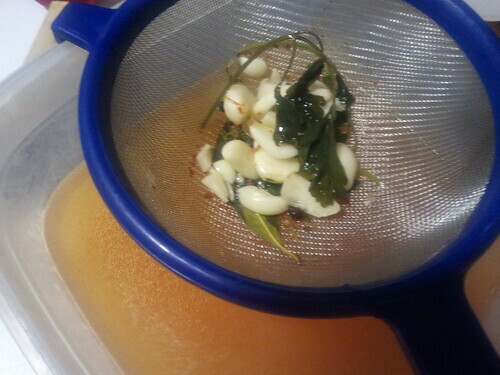 Add the garlic, remaining ingredients, and 2 quarts water and bring to a boil. Lower the heat and simmer, partially covered, until the garlic cloves are soft, about 45 minutes. Strain. 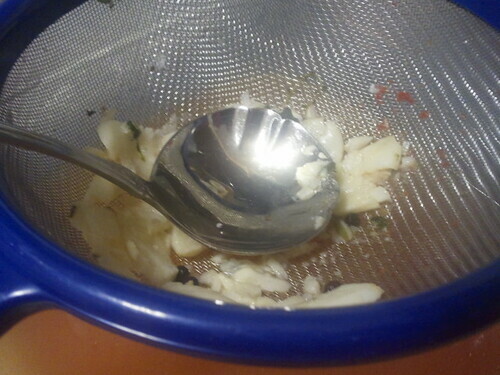 Press the garlic through the strainer with the back of a spoon into the broth or press it into a dish and use for another purpose. 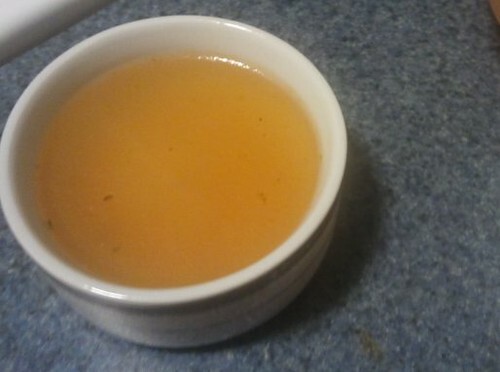 I only took one picture of the final broth. 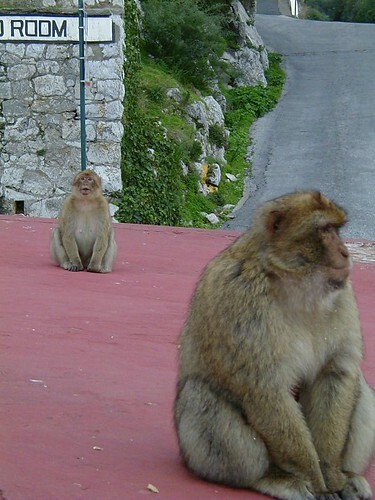 To make it up to my Veggin’ fans, here’s a picture of two Gibraltar monkeys. This hearty and earthy side dish was the perfect accompaniment to the cabbage rolls served during our monthly vegetarian club dinner featuring Eastern European recipes. The original recipe also included the final step of dishing out the potatoes on the plate, adding the mushrooms and breadcrumbs then sticking it under a hot grill to brown the top. I did not have the luxury of being able to perform this final step as I needed to be able to carry my dish on the Metro. Instead, I layered it in a casserole dish and let it sit in the oven until browned. Then I wrapped the dish up for its journey across town. It transported very well and, the teeny tiny bit that was leftover, reheated nicely. It’s certainly a different riff on the same old mashed potatoes. Bring large pot of water to a boil. Add potatoes and cook until tender. Drain and add back into pot. Pour milk over potatoes. Mash well. Stir in chopped herbs, add butter/margarine, salt and pepper to taste. Melt 1 Tablespoon butter in saute pan. Add mushrooms and garlic and cook until heated through and soft – about 5-8 minutes. Stir in cream. Cover and reduce heat to low to keep warm. Melt the last Tablespoon of butter in a pan, stir in panko and herbs. Let panko toast and warm a bit. Remove from heat. Lightly cover the inside of a casserole dish with non-stick cooking spray. Put potatoes in as thick bottom layer leaving enough room for the mushrooms to sit on top of them. Put mushrooms and sauce on top of potatoes. Sprinkle top with panko. Place in oven preheated to 400 degrees. Leave in oven until top is golden brown – about 10-15 minutes.